Need an herbal survival guide for the flu? Herbal Prepper Live has you covered. 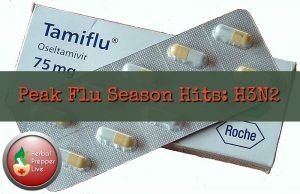 This week’s show is all about influenza, the H3N2 strain, and herbal remedies for the flu. Listen to this broadcast or download “Surviving the Flu with Herbs” in player below! The flu has been all over the news, and for good reason. This year’s dominant strain, H3N2, has historically proven itself to be a greater risk than other strains. The danger here is not that this year’s flu is going to infect more people. But, for those who do get H3N2, they run a higher risk of developing a serious illness. H3N2 is more likely to lead to dangerous secondary, bacterial infections, such as bronchitis and pneumonia. Pneumonia results in more serious symptoms, more hospitalizations, and more deaths. This strain is harder on the very young (under 5) and older populations (over 65). To complicate matters, the H3N2 strain has also historically shown it is less susceptible to the flu vaccine than other strains. This year’s vaccine is only 10% effective in preventing the flu. News reports from all over the United States tell of school closings and hospitals at capacity due to the flu. Some hospitals are setting up beds in conference rooms and hallways. Others are turning people away, even those brought in by ambulance. Be sure to check out the Event Calendar on my website at www.herbalprepper.com to see more information about upcoming. You can even add a reminder to listen to your iCal or Google calendar! Previous: Previous post: Eve Gonzales Trading Post in the Woods! Next: Next post: 3 Expert Tips on How to Organize a Bug out Bag!